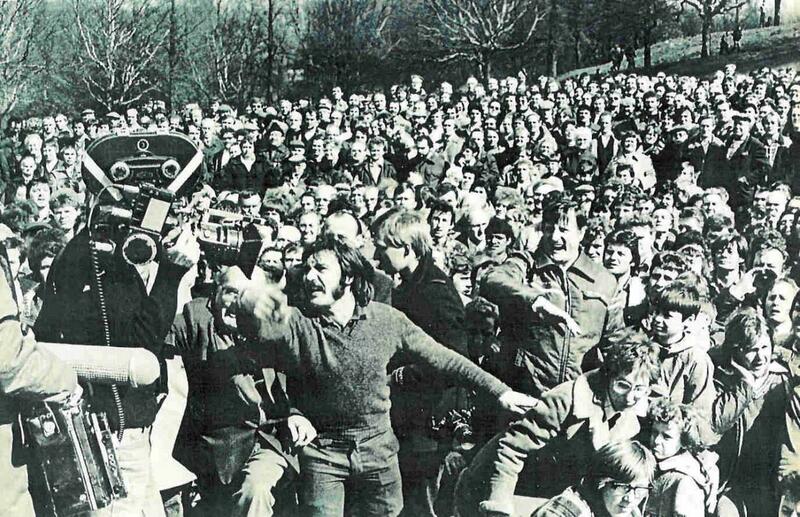 A short history of the of the widespread strike movement that occurred during the winter of 1978-1979 in Britain. The 'Winter of Discontent' marked the largest stoppage of labour since the 1926 General Strike. The factors that provoked the widespread stoppage of work by thousands of British workers in the winter of 1978-79 began with the Labour government of James Callaghan's attempt to enforce limits on pay rises to curb inflation. Inflation had reached a height of nearly 26.9% in August 1975. In the same year Harold Wilson's Labour government, wanting to avoid increasingly large levels of unemployment agreed a voluntary incomes policy with the TUC that would cap pay increases for workers at limits set by the government. The government announced a limit on wage rises of £6 per week for all workers earning under £8,500 a year on July 11 and the TUC general council soon voted in favour of the proposals. Further limits on pay increases were proposed by the government through 1976 and in July of 1977 it was announced that free collective bargaining between employers and unions would be slowly phased back in. Wishing to avoid a "free-for-all" rush for pay increases by the unions, the government allowed the return of collective bargaining to happen only with the agreement of the unions to continue with wage increase limits agreed in 1976 and a promise not to reopen any increase agreements made from previous policy, which the TUC agreed to. Inflation had more than halved by 1978, however, the government continued its policy and in July 1978 introduced a new limit of 5% on wage increases. Surprising the TUC, who had expected the pay limits to end, the 5% policy was overwhelmingly rejected by the general council and the immediate return to free collective bargaining was pushed for. An announcement was made by James Callaghan in September that an expected general election was not to be called, instead it was chosen to hold it the following year to allow the economy to stabilise. The spark that began the wave of industrial action that was to hit the UK in the following months was lit by the workers at Ford Motors. In September a pay increase was set by the company within the allotted 5% designated by the government and was wholeheartedly rejected by the workers. A strike began when 15,000 Ford workers walked off the job on September 22 and by September 26 had been joined by 57,000 others, leaving 23 Ford factories up and down the country empty. Still an 'unofficial' strike by early October, the Transport and General Workers Union (TGWU), fearing the level of rank and file control over the day to day running of the strike, decided to support it on October 5. The workers' demands of a 25% pay increase and 35 hour week were made official and negotiations with Ford commenced. After several weeks the TGWU agreed on a 17% pay increase, the idea of a shortening of hours having been completely dropped, and urged the strikers to return to work on November 22, which they did. When it became obvious in mid-November that Ford was going to offer a pay deal over the 5% limit, government-TUC negotiations commenced in order to be able to work out a concrete agreement on pay policy in an attempt to halt further strikes. A weak policy was worked out, but the vote became deadlocked at the TUC general council and was rejected. The government attempted to impose sanctions on Ford for breach of the pay policy soon after the deal had been struck with the union. Callaghan narrowly won a motion of confidence after the sanctions had been heavily amended in Parliament and accepted that they could not be imposed. This effectively made the government powerless to enforce the 5% limit of pay increase, leaving the door open for more strikes in private industry and later in the public sector. Next to take action were the lorry drivers. Following the initiative of BP and Esso tanker drivers who had begun to refuse to work overtime in support of a 40% pay increase, all TGWU drivers struck on January 3. Thousands of petrol stations were closed after the break down of distribution caused by the strike, and drivers picketed ports across the country as well as firms who still had lorries on the road. Refineries were also picketed and tanker drivers who were still working notified strikers which refinery they were headed to so as flying pickets could get there first and turn the tankers back. After bringing supplies transported by road to a virtual standstill, and after just less than a month of strike action, the drivers accepted a pay deal just £1 less per week than the union had asked for. The weeks during and after the lorry drivers strike were marked largely by strike action being taken by public sector workers, determined to keep up with the wage increases of their counterparts in the private sector. A number of important strikes were launched, several of which still evoke images iconic of the struggle during the winter of 1978-79. January 22 saw a "Day of Action" held by public sector unions, following several strikes of railwaymen that had already begun. With 1.5 million workers out, the day marked the largest general stoppage of work in the UK since the General Strike of 1926. Mass demonstrations were held in many cities, including London, Cardiff, Edinburgh and Belfast. About 140,000 people took part in the demonstration in London. Schools and airports closed for lack of workers, and ambulance drivers struck, although in many areas continued to respond to 999 calls. Following January 22, many workers remained on strike indefinitely. Also to take action were members of the Royal College of Nursing, traditionally one of the least militant 'unions' in the country, who demanded a 25% pay increase. During the ambulance drivers strike in mid-January it was also reported that staff in 1,100 NHS hospitals were refusing to treat anything but emergencies. A strike of gravediggers who were members of the GMWU (now GMB) occurred in Liverpool and and Tameside in late January. An event that is often recalled clearly from memories of the period, the strike prompted one local health official to confide in a journalist that burials at sea were being considered by the local authority if the strike became prolonged. After two weeks of strike action, the gravediggers accepted a 14% increase and returned to work. Another memorable strike occurring towards the end of the winter was that of the waste collection workers. With many collectors having remained out since January 22, local councils were running out of space for storing waste. Rubbish was piled high in Central London's Leicester Square after Westminster Council had allocated rubbish to be dumped there. The rubbish attracted rats and, rather indistinguishably, the conservative media, who used pictures of the Square in an attempt to discredit the strikers. Continuing its constant campaign throughout the winter criticising the strikers through the medium of the "breakdown of public convenience", the pictures of the piled rubbish presented itself as yet another front on which to attack the workers. The waste collectors strike ended on February 21, when the workers accepted an 11% increase and an extra £1 a week with possible increases in the future. The strikes, from the perspective of the TUC and the government, ended on February 14 after weeks of negotiation. A proposal was put to the TUC general council and agreed after several days, bringing an end to the winter long series of disputes. Due to the lack of control many unions had over their members by this time, many strikes did not end immediately after the agreement, testimony to the initiative exercised by many rank and file workers throughout the period who were willing and able to work and initiate strikes outside of their union's control. Most had returned to work by the end of February after a total of 29,474,000 working days having been lost to strike action. The direct action help stem the tide of effective pay cuts by inflation eating up the value of their wages and won significant improvements for many tens of thousands of workers. Many strikes did not end immediately after the agreement, testimony to the initiative exercised by many rank and file workers throughout the period who were willing and able to work and initiate strikes outside of their union's control. What books did you use to write this? I really need a list of good books for this topic.